It begins, with trees, lights and the warmth of friends and neighbors to start the holiday season just right. 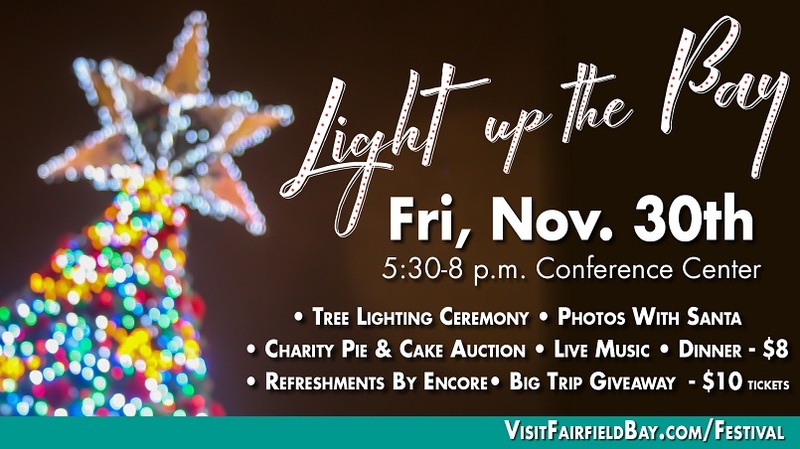 The “Light UP the Bay” holiday season kickoff is planned at 5:30 p.m. Friday, Nov. 30, at Fairfield Bay. In addition to a big trip giveaway, there will be live music, food, a charity cake and pie auction and the lighting of the Christmas trees for the annual holiday celebration Festival of Trees. The vacation giveaway includes lodging, food and entertainment at Branson. Tickets are just $10. To purchase tickets for the Big Trip Giveaway, visit ffbchamber.com. A portion of the funds raised will go to help the needy in the area by supporting the Shirley Food Bank. The holiday season in the Bay is a winter spectacular with the annual holiday celebration Festival of Trees, scheduled Tuesday, Dec. 4, through Friday, Dec. 14, as Fairfield Bay’s Conference and Visitor Center is transformed into a wonderland of holiday elegance and whimsy to suit any age, family or individual. Explore this special forest of trees and leave inspired and ready for the season. Each Christmas tree is decorated from its starry tiptop to its blanketed base. No two are alike and range from whimsical to traditional! Be sure to cast a ballot for your favorite. And while you’re there, look for the special donation box to help local families in need with a local food bank donation. Trees will be on display from 9 a.m. to 4 p.m. Tuesday through Friday. Families are encouraged to bring cameras and capture their special holiday photos. And if you want to enter a tree, there’s still plenty of time and it’s free! The trees may stay up throughout the month of December and on into the new year. It is a great way to advertise a business or just simply show your Christmas spirit! Corporate sponsors are Cowboy Chevrolet Buick GMC, Noacon, Ozark Resort Homes, Goodwin & Herman Real Estate, Brown & Brown Insurance, Regions Bank and Petit Jean Electric. To find a complete list of events and times as well as more information, visit visitfairfieldbay.com/events or call 501.884.4202. Funds raised through this event will fund Chamber programs and events in Fairfield Bay.